The upside to adversity is that I get to learn something. If that’s true then I am an expert genius on problems with my left foot and lower-leg. I’ve fought various aches and pains in my left foot region and the war continues! I am grateful to be on the very tale end of a successful battle against posterior tibialis tendinopathy (PTT). Why does a tendon hurt? The injury mechanism is that the tissue has been stressed beyond its ability to recovery. Too much stress/too fast/too often is the problem. Thus, the tissue must be unloaded and rested enough that it heals. Tendons, compared to muscle and skin, don’t get much blood flow so they need longer to repair than blood-rich tissue. I took the whole month of January off. Every runner — probably every athlete or fitness enthusiast in any discipline — shudders at the idea of taking time off, especially a whole month. “I’ll get out of shape!” or “But I have a race in X-number of weeks!” we say. Well, here’s some news for you: If you’re injured then you’re out of shape. Let’s say that together: IF YOU’RE INJURED THEN YOU. ARE. OUT. OF. SHAPE! You’re busted. Broke. Lame. Dead in the water. Out of the race. It’s the agonizing truth. If you’re injured then you’ve dug your way into a hole. Trying to run your way out of a running injury is like trying to dig your way out of a hole. If you don’t want to prolong the condition, if you want to get back to serious training (as opposed to piecemeal, sporadic, painful, crappy training) sooner rather than later, then STOP RUNNING RIGHT NOW! Bite the feces-covered bullet and prepare to take several weeks off. This is a test of your discipline. You may think you’re disciplined because you do all this running but discipline isn’t doing what you like to do, discipline is doing what you need to do. Or, just like me and a bunch of other runners, you can believe you’re the exception, you’re made of magic, you’re different from all the other humans and your PTT will resolve in miraculous fashion. I took a few days off, tried to keep running, and I was still hurt. I did that a couple of times. Reality, in all its brilliant, gruesome glory was sitting on my chest, trying to kill me. But January was a better month to take off than all the other months coming my way and I decided it was time to stop being stupid. You’re a grownup. You’ll make your own decision but guess what: At some point you’ll stop running. You can either make the choice or it’ll be made for you. Fortunately, I could bike and lift. Those aren’t perfect substitutes for running but what is? I was able to keep my body in decent shape. I found peace of mind, and a sense that I wasn’t helpless. The good news is I improved my cycling and my numbers went up on the weights. Hooray me. Dr. Nick Studholme is always helpful when I’m hurt and can’t figure out why or what to do about it. He showed me how to use Dynamic Tape to help unload the tendon. He also provided me with the following two resources. Zeren PT Return to Running Program. I like the specific, progressive instructions here. Even though I’m a fitness professional, it helps if I get outside guidance and rules to follow. As the saying goes, “The lawyer who represents himself has a fool for a client.” Might as well replace “lawyer” and “represents” with “coach” and “coaches.” If left to my own guidance then I’ll tend to do too much too soon too fast and I’ll get hurt again. 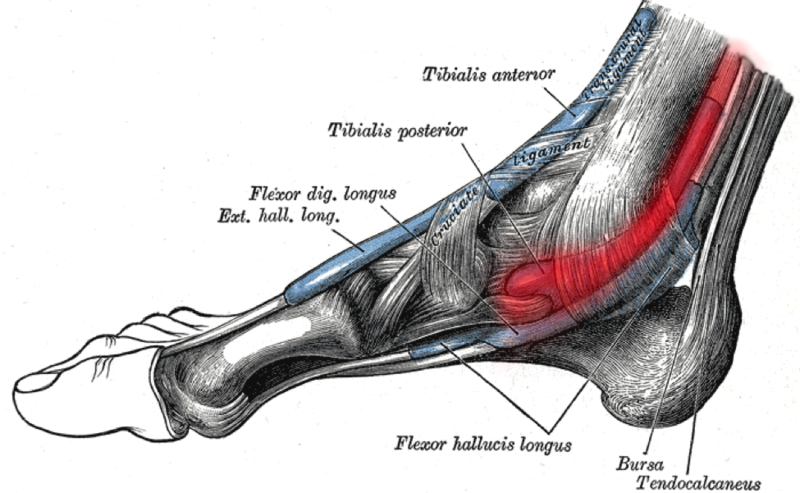 4 Ways to Prevent and Treat Posterior Tibial Tendonitis is from Runnersconnect.net. This is a thorough, well-researched article. In it you’ll find various strategies to address PTT including pictures, exercises, and specific exercise protocols. I used a lot of the information here. Below is a taping strategy that can help unload the posterior tibialis and support the arch. Dr. Nick Studholme used Dynamic Tape on me. I’ve been taped with KT Tape and Rock Tape before and I can say for certain that Dynamic Tape provides more resistance than either of the other two and it stays on longer. Also, I tried doing it on my own and it doesn’t work. Get a friend to help or have your physiotherapist do it. In the past, fixing my technique was the key to overcoming a collection of running-related problems and pains. I believe a regression in my technique is what brought on this PTT. I know how to run. I help my clients regain good running form — but I’m not perfect and I can’t watch myself run. My technique slipped and I didn’t know it until I got some expert eyes on the case. I’m enormously grateful for the help of my new running coach, Andrew Simmons of Lifelong Endurance. Through his guidance I’ve shored up my technique. The first time we met he videoed me running and we saw some faults. I won’t go into the specifics here but he helped me bring awareness to what I was and wasn’t doing correctly and now I’m running better. I believe good technique will help keep my tendons healthy. If you’re dealing with nagging running injuries then perhaps the way you’re running is the problem. I highly recommend time with a coach. You don’t know what you don’t know. The right coach does know. It’s money and time well spent. My PTT was similar in some regards to achilles problems I’ve had in the past, but it was different in its tenacity and response to treatment efforts. In the next post I’ll discuss my rigid arch and why I believe it has contributed to my foot problems. 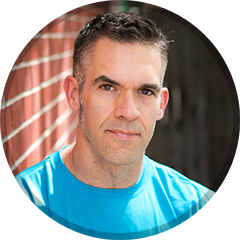 I’ll also demonstrate a mobility drill, foam rolling techniques, strength exercises that helped, and some running technique points. Injury and performance exist on a sliding scale. At one end we are completely broken down, hurt, and unable run/bike/swim/lift/fight/hike/etc. At the other end we’re performing at our peak. Probably every active person has been injured and I’m willing to bet that every active person would like to perform their very best. This post is for runners in either or both camps. Runners are often injured. According to a review of literature in the British Journal of Sports Medicine, rates of lower-leg injury ranged from 19.4% to 79.3% among study subjects. The magic questions are 1)Why do we get injured? and 2) How do we overcome injuries? I think it stands to reason that if we hurt while running then very likely it’s the way we run that’s the problem. Running requires complex coordination among many parts and systems. It is mind boggling to try and dissect running form, find the problems and then either teach or learn new, helpful techniques. Meanwhile, if we’re not injured and we’re able to run, then we probably want to know how to run faster and more efficiently. How do we we achieve these goals? These questions aren’t easily answered. With all that in mind, I found two resources that may offer some very valuable information on these issues. If the knees cave in too much while running: He puts brightly colored tape on the outside He has the patient run on a treadmill facing a mirror. He tells the patient to push the tape out toward the walls. If the hips are adducting too much: The runner runs on a treadmill facing a mirror with the waistband of their shorts clearly visible. He instructs the runner to keep the pelvis level by keeping their waistband level. “For running economy, three variables stood out: vertical oscillation (measured by the up-and-down motion of the pelvis; less is better); how bent your knee is when your foot hits the ground (more bent is better); and braking (also measured by looking at the motion of your pelvis; less slowdown as your foot hits the ground is better). “Overall, these three variables explained 39.4 percent of the individual differences in running economy—and the vast majority of that (27.7 percent) came from vertical oscillation. 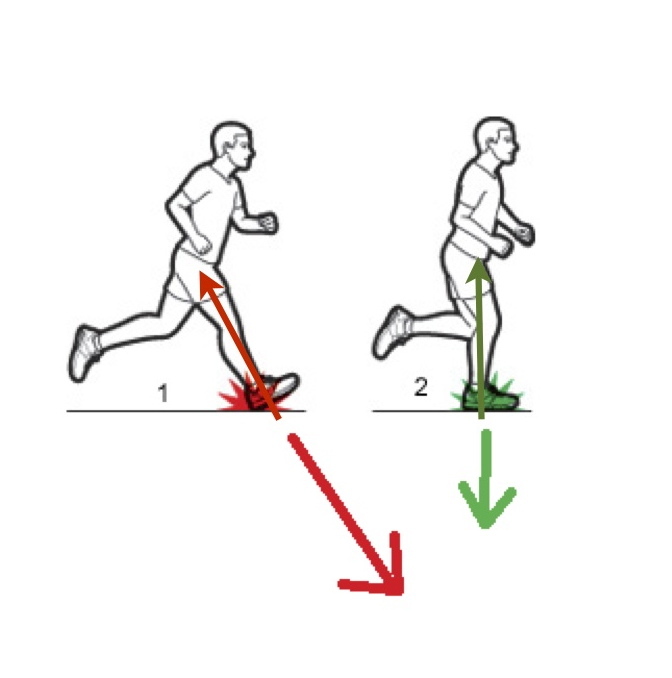 “For running performance, four variables stood out: braking (as above); the angle of the shin when your foot hits the ground (closer to vertical is better); duty factor (basically a measure of how long your foot stays on the ground relative to your overall stride; quicker is better); and the forward lean of your trunk (more upright is better). Something I always appreciate about Hutchinson’s writing is that he lays out some of the errors in thinking that we might encounter when we assume that employing new running techniques will automatically equal better, faster, pain-free running. Are these characteristics of efficient runners chickens or eggs? Ideally, you should be videoed while running.Trying to adjust your gait without knowing how you’re currently running might be near impossible. Video is a very powerful tool when it comes to making adjustments to sporting techniques and I highly recommend it. Definitely read the article and listen to the podcast if you think you need help with your running or if you’re a coach who works with runners. And if doing it yourself isn’t getting you the results you want then I strongly suggest you employ some sort of running coach to help. In Part I of this series, I discussed what hip adduction is and why it’s crucial for good movement, balance and sports performance. In this post I’ll give some ways to self-assess your hip adduction and increase your hip adduction mobility, stability and power. There are many ways to investigate and train hip adduction. I do not propose to cure what ails you with any of these exercises. If you’re in real pain then you need to see a physician. Check your ability to move into hip adduction. Check both right and left sides. How do they compare? Now check your stability. Can you control your hip adduction? Try this mobility matrix to gain more hip adduction. You may need more on both sides. The great thing about this matrix is that you’re not only address the hip but you’ll also be mobilizing other joints in concert with the hip. This movement series is a more aggressive way to challenge hip adduction while at the same time getting an upper body workout. Running form is a frequently discussed topic among injured runners and runners looking to perform better. How should we run? Is there one ideal way to run? Should we run on the forefoot, mid-foot or heel? Does our core matter? What should our upper body do when we run? There are many schools of thought in the running world and there doesn’t seem to be any ironclad consensus on any of these questions. If you’re running pain-free and you’re performing as well as you’d like then I don’t believe you should change your running form. In other words, if it ain’t broke, don’t fix it. If, on the other hand, you experience pain when you run or if you’re not as fast as you’d like to be then some technique changes may be in order. Imagine a chain is attached to the top of your skull. That chain pulls you up. It lengthens your spine and makes you tall. See if you can feel this long, tall spine as you run. As part of this process, keep your gaze up and out toward the horizon. Don’t stare at the ground directly in front of you. This tall posture should help with some of our other running form considerations. Tight hip flexors may contribute to a hunched posture. The following stretch sequence may help. The impact of the foot hitting the ground is worth considering as it concerns injuries. Recent evidence suggests runners who hit the ground lightly are injured less than runners who hit the ground hard. You may run with earphones and you may be unaware that you stomp and pound the ground with each footfall. So to run light, remove the earphones and pay attention to the sound you make. Imagine you’re weightless. Your strides are feathery light, and energetic. You don’t pound the ground but rather you glide across gossamer. Use a short, quick gait. One way to lighten the impact of running is to drop the foot very nearly under your hips. This should result in your shin being vertical or near-vertical. Look at the picture. Try running like #2. The skipping drill from above can help you feel that foot landing directly below your hips. Want to run lightly? Run like #2. Don’t concern yourself with whether or not you’re hitting on the heel, mid-foot or forefoot. Where the foot lands is more important than on what part of the foot hits first. Quickening your cadence too much can be a problem. There is an obvious point at which gait can becomes too quick and inefficient. An excellent way to work on your cadence is to use a metronome. Kinetic Revolution has a great article that discusses research on cadence as well as how to introduce metronome running into your training. The article also links to a digital metronome that you can download. Running may seem like something we should all be able to do. In fact, most of us can execute some version of movement in which we rapidly put one foot in front of the other. Kids learn to run without detailed instruction and without much in the way of typical running injuries. Shouldn’t adults be able to do the same thing? Maybe or maybe not… If we hurt while running or if we think we’re too slow, then some sort of alteration to our running style may make sense. Changing your gait takes some tinkering, some awareness and mindfulness. It won’t happen automatically. Physical therapist Rick Olderman helped me to change my running gait. He once said that “if it feels normal, then you’re doing it wrong.” He meant that in the early stages of changing how we move, it should feel weird and unnatural to us. Learning any new skill requires some struggle and awkwardness. If you practice frequently and work at it then things should improve at a reasonable rate. Personally, I never listen to music while running. I pay attention to how I run, where my foot falls, how I move. I don’t want to fall back into bad habits. I can’t guarantee that any of these changes will result in either a pain-free running experience or a podium finish in a race.Time with a physical therapist, podiatrist, chiropractor and/or a running coach may be what you need. That said, these cues have helped my running as well as several of my clients’ running experience. I’ve also incorporated things like the short foot drill, ankle dorsiflexion work, and a wide variety of single-leg squats and lunges (here, here, here for instance) to improve my movement competence. Clearly, there are a lot of moving parts to consider when we run! The toes, feet and ankles get no respect. I’m not sure a lot of people walk into the gym and say, “Okay, today is foot and ankle day! Gonna work those parts hard and make ’em strong!” We throw shoes on them and ignore them. Think about this though: It’s only every single step that we need those obscure parts to work correctly. 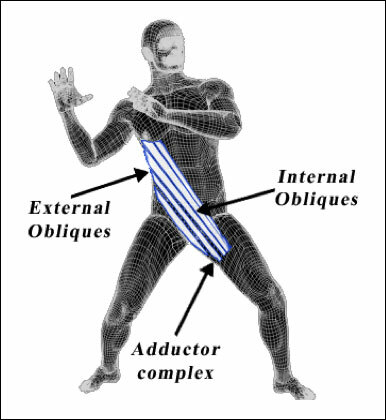 If we look at the body as a kinetic chain then we start to see that the feet and ankles don’t live in isolation. Movement or lack there of at the feet and ankles may create problems all the way up through the legs, hips, spine and shoulders. If an athlete doesn’t have sufficient motion at the ankles then he or she may not perform at his or her best. Similarly, limited foot and ankle motion may be a contributor to pain. I’m not just talking about foot pain either. Again, if we consider the interconnectedness of all the joints and limbs of the body then it may not surprise us that faulty foot/ankle movement could contribute to back knee pain, hip pain, back pain — even shoulder or neck pain! Dorsiflexion: There’s no substitution for it!